Love the colors for our challenge: cadet blue...taupe...kraft/flesh. Some of those colors reminded me of Band-Aids, so I used Wellness Wishes from Stampin' Up!. I've never inked up this little bandage guy -- he's THE CUTEST! ...and Creamy Caramel cardstock, embossed with Perfect Polka Dots and reversed. (basically, it's de-bossed) This is a dead-ringer for a Band-Aid color. Go have some fun with our colors, and you just might win the Cup of the Week prize! Stamps: Wellness Wishes - Stampin' Up! I've got a get well card to show you today. It is for my husband's college friend. We recently found out that he was injured very badly in a farming accident. It involved a large machine that helps roll up those huge, round hay bales you sometimes see dotted on farmland. It has a very pointy arm on it, which helps lift those round bales. The point impaled this man through his shoulders, completely missing his heart and lungs, but damaging a lot in the process. He's been in the hospital for weeks now. I thought this card might cheer him up a little. I stamped a flourished square three times across the bottom of the card. It's from a new-to-me set by American Crafts called Majestic. I got it from TJ Maxx for $1.99. To be honest, it's a little hard to stamp with. The images don't come out real crisp and clean, as they should. Well, at least it was only $2 that I shelled out! The bow was made with two loops of ribbon, each secured on the ends with Scor-Tape. Then I attached Scor-Tape to the bottom of each loop, and mounted them together. Sorry I didn't take any pics to show you. Hooray! 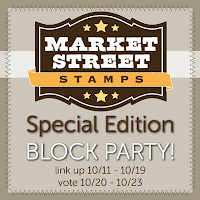 I am one of the 10 *SPECIAL EDITION* Market Street Stamps Block Party Finalists!! Please click here to vote! If you click on the picture, it'll take you to the post where I show close-up details of the frame. You may vote for up to 3 finalists each day, one vote per finalist thru Sunday, October 23rd - 11:59 CDT. Thank you so much for your support! I am very excited! Welcome to the 2nd Anniversary of the Play Date Cafe! We've got some very special prizes for our challenge this week. The goodies are going to make several winners really happy! Our sponsors this week: Layers of Color, Sweet Stamp Shop and The Twinery. As soon as Jaclyn put up this color story, I knew right away what I could do with it. The focal point is a sticker from K & Co. that I've had since the summer. I think it's so beautiful! 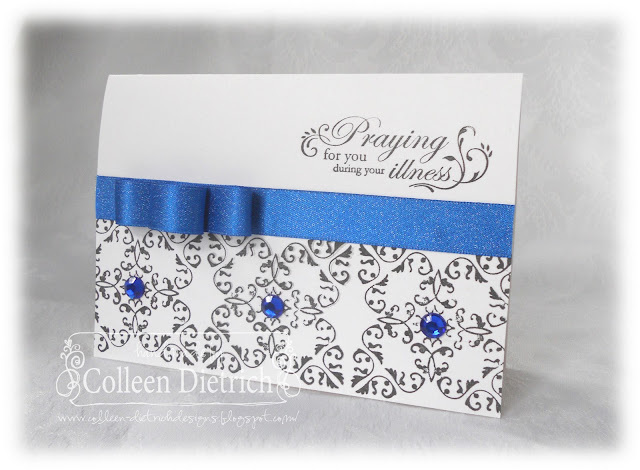 I set it upon a piece of white cardstock, stamped with script and then punched. The sentiment is from Verve's Celebrating You. The background paper is Anna Griffin. The green strip is a Stampin' Up! sticker - and of course, it's retired (so many of my SU things are). I hope you get a chance to play with us for this extra-wonderful week at The Cafe! Today is my Punkin's 10th birthday. I love that she has an October birthday. Fall is my favorite time of year, and our wedding anniversary passed just days ago. We have a whole slew of birthdays this month too, in our extended families. This card is entered at City Crafter, where the challenge is Harvest Festival - fruits or vegetables. Kerry opened her gifts before going off to school today, and she loved her card. We have a magnet of this pumpkin image on the fridge, so she thought I might've photocopied it from there. 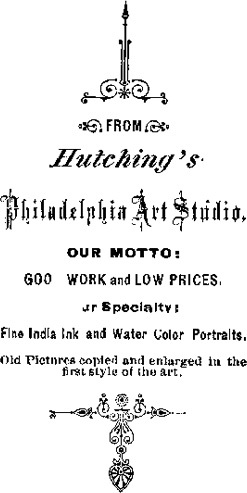 I actually downloaded the image from The Ephemera Society, through Pinterest. The patterned paper is from DCWV Four Seasons stack, which I picked up for $5.99 at TJ Maxx recently. The black cardstock is mounted on a white card base. I seem to use white card bases ALL the time, and I do love Papertrey Ink's version - bright white, thick and sturdy. When I was new to paper crafting, all I had was Stampin' Up! 's white cardstock. Now I think it's rather flimsy, compared to other brands. However, it comes in handy for a couple of things: border punching (it's tough using PTI cardstock for that; I've broken punches) and sending it through my home printer. I used the SU stuff to print this pumpkin. Well, thanks so much for joining me today! 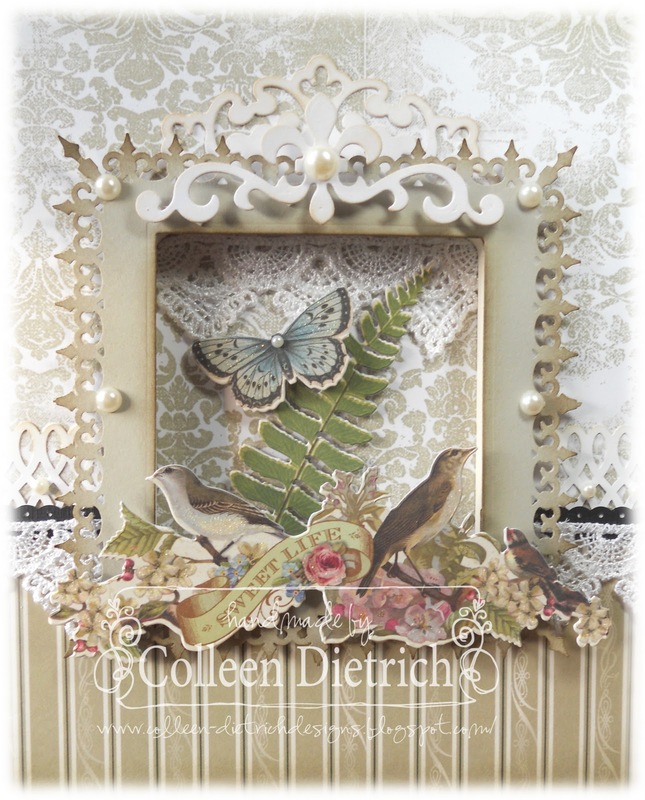 ETA: This home decor wooden frame, 7 1/2" square, was chosen as a Top Ten Finalist at Market Street Stamps! Please vote for me HERE. :) My creation is #4. Thank you so much!! I have a good friend named Linda. My 9 YO is best friends with one of her daughters. Linda often has my daughter for playdates, takes her on excursions, and is a leader in our Girl Scout troop. She picked up my child's Girl Scout uniform and other supplies for me, sewed the patches on the vest, and brought it to the meeting. Linda took great care of my kid while she attended her first camping trip ever last weekend, with the troop. 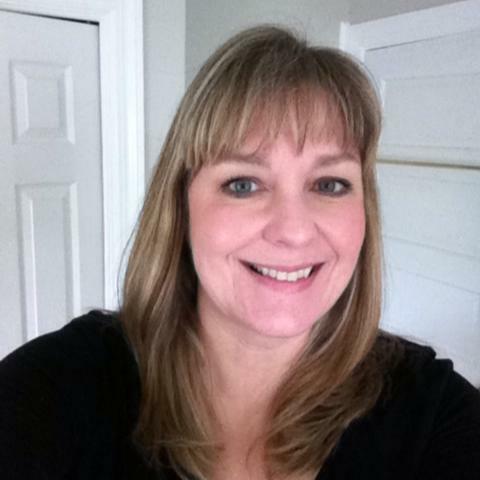 Linda is funny, compassionate, thoughtful and always willing to help. She was the first person to commission a card from me, too - the "Inspired by an Anthropologie Mug" card. I owe her so much, and wanted to make something extra special for her upcoming birthday. I used Market Street's Vintage Wallpaper background. LOVE it! 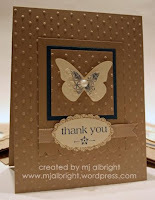 I stamped it four times in Sahara Sand ink on white cardstock to create my own designer paper. I left some areas uninked on purpose for a distressed look. I used a wood frame ($2.99) from a local craft store as my base. One of the first additions to the frame: Infinite Loops double edge trim punch in white, and Dotted Scallop in black. The venise lace is from eBay. These things I was sure about adding. After that, much pondering took place! The next additions were die cuts - a Parisian motifs large circle, cut down, and a flourish from Fleur De Lis Motifs. Then I thought of making a frame with Iron Gate corner and edge punches. I used a square die to cut out the center. Next came a portion of a K & Company die cut border. And more K & Company die cut borders make an appearance. I trimmed only what I needed - one butterfly and a bit of fern. I am also entering this at Moxie Fab's Textured To Perfection challenge. This frame is full of texture, with the lace, the pearls, the die cuts, with so much dimension. I am SO proud of this creation. I think it is my best work yet, in the papercrafting phase of my life. My 9 YO thinks I should make more of these to sell at an upcoming craft fair (my first!). While this is a wonderful idea, it is very time-consuming. I may have time to make one or two before the early November date. 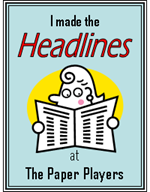 On Thursday, there'll be a new challenge for The Play Date Cafe. You don't want to miss this one! It's our Two Year Anniversary, and there are some AWESOME prizes to be had for SEVERAL lucky crafters! Thanks for visiting me today. I know it was a very long post. Tomorrow marks my 17th wedding anniversary. My husband and I met in high school. We dated a little during school, then went off our separate ways for colleges. When we were 22 years old, we got together again, and have been together since (that's 23 years!). The fleur-de-lis paper is from the DCWV Mariposa stack. The Eiffel Tower is by Our Craft Lounge (Vintage Traveler), the frame Notably Ornate by SU, and the sentiment a combo of stamps ("Love") from Squarely Sentimental by Fiskars and Carpe Diem ("You") by Hampton Arts. Those butterflies are from an old SU set, Botanicals, which I got cheaply on eBay not that long ago. Love the set!! 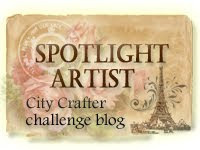 This card is entered at the City Crafter challenge, using primarily black and cream. My friend Stella Schenkel is the guest artist this week over there, and I'm so glad for her! 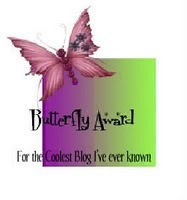 She is one of the most delightful people I have met, and has some utterly gorgeous creations on her blog. I also entered at Ribbon Carousel, with my 'sparkle and bling' (gold papers, pearls). October is a busy month for us, with many birthdays and of course our anniversary. We have another anniversary to add to it now: it's been one year since our beloved Smoat kitty died. Although I am so fond of Cristabel, the black cat we adopted in January 2011, nothing can replace that good ol' orange boy of mine. He was simply the best. Good morning! Many of you know I do not have a craft room. I use my dining room table, which is the only table in the house. My supplies have to be tucked away, as out of sight as possible so no one trips over the stuff during our daily lives. 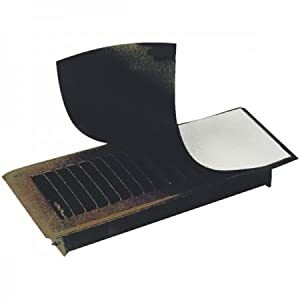 I recently read about someone using magnetic vent covers for Spellbinders Die Cut storage, and thought that would work for me too. My craft cabinet is our former TV/entertainment armoire, now located in the dining room. The inside of the doors were transformed last night into die cut heaven! Unfortunately, that 3-pack of vent covers didn't create enough storage for me, so I thought of something else. That same binder holds pictures of all my stamps and punched-out pieces from all of my punches, too. I couldn't get along without that Big Binder! This is such an eclectic assortment, and I kind of like it! I punched some old Stampin' Up! Vintage Violet cardstock, and mounted it behind a book page and a piece of lace. 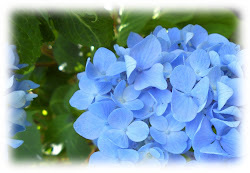 The lilac clip art is from Crafty Secrets. This button (and many others) was passed on to me by my aunt, who holds the button collection that her mother had. Thanks, Aunt Kay! See the green stuff on the button? I cannot scratch it off, but it worked out really well for our color challenge. 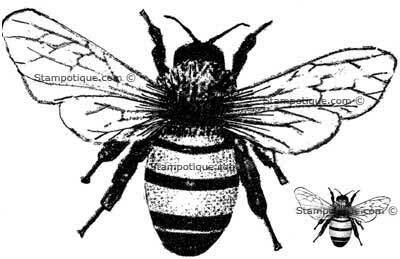 I used Crystal Effects on both bees, just 'cause. You'll want to head over to The Play Date Cafe and see what the rest of our crafty team has made for you. We hope you get a chance to play with us, too!